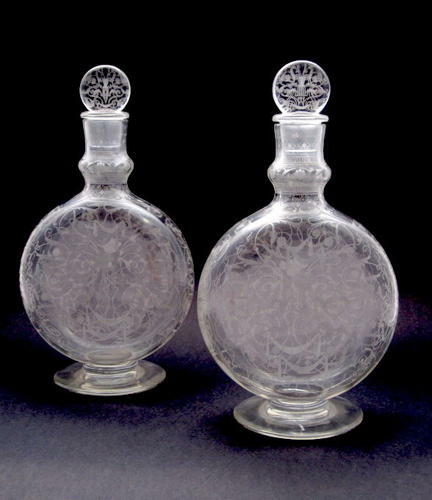 A Tall Pair of Antique Signed Baccarat Engraved Perfume Bottles and Stoppers. Finely Engraved ‘Michelangelo’ Pattern by Famous Baccarat Crystal Makers. Engraved 'Michelangelo' Design with Arabesques, Geometric Pattern of Flowers, Leaves and Spiralling Stems. Each Piece is Signed BACCARAT.